An exhibition opened at the Old Mill Cultural Centre this week that exposed the secrets of the fruit; it has been a national staple here for centuries. "It's a general exhibition," said Raymond Lawrence, the Chief Cultural Officer. "It's art it's craft it's food". The exhibition is part of Dominica's observance of Independence; it is the third in a series of exhibitions highlighting Dominican produce. Other exhibitions have focused on the banana and the coconut. Breadfruit is a very popular fruit that originates out of the flowering species. Scientifically known as 'Artocarpus Altilis', the breadfruit plant is a member of the 'mulberry family', thus making it a variance of mulberry. Native to the Malay Peninsula and the western Pacific Islands, the fruit's shape, size and feel is unlike any typical fruit, as it looks like bread. The breadfruit is soft and has a yellow, cream coloured flesh, which is sweet with a nice fragrant smell. Breadfruit, because of its unique texture and several nutritional values, has become quite popular and is now been grown in many other parts of the world. Breadfruit has been recognized as a nutritionally beneficial fruit by many civilizations and communities, and is also culturally important for many people across the world. A wide range of nutrition and useful calories can be consumed by eating breadfruit. Nutrition Benefits of Eating Breadfruit •Breadfruit is an energy booster and is high in fibre contents. The fibre content in breadfruit helps in decreasing cholesterol and triglycerides that causes several heart diseases. Consumption of breadfruit lowers the LDL (harmful cholesterol) in the body and elevates HDL (good cholesterol) count, protecting you from the risk of heart attacks. •The fibre content in breadfruit provides a relief to the people suffering from diabetes. Research proves that the fibre content in the fruit can control diabetes, by reducing the absorption of glucose by the body, from the food we eat. •Breadfruit even helps in the proper functioning of our intestine and bowel. The fibre present in breadfruit regulates bowel movements and clears the build-up of junk in our intestine. Consumption of breadfruit on a daily basis can even help in reducing the risk of colon cancer. •A breadfruit contains a good amount of omega-3 and omega-6 fatty acids. These fatty acids are very important and help the body and mind to develop normally. These fatty acids also hasten and stimulate skin and hair growth, regulate our metabolism, promote reproduction and stimulate bone growth and health. •Breadfruit is considered to be a potential item for chick feed also. However, it produces less weight gain than cassava or maize despite higher intake, and can even cause delayed maturity. •Breadfruit contains vitamin C, thiamin, riboflavin, niacin, iron and phosphorous. All these minerals and vitamins provide essential nutrients to the body. •Breadfruit is also used in the flour form that is richer than wheat flour in lysine and other essential amino acids and is useful for the growth and development of the body. Cooking Tips •Breadfruit is ground to flour in many parts of Barbados and Brazil to substitute wheat in bread making. The bread made from breadfruit flour has been found to be more nutritious than the wheat flour. •In Jamaica, the breadfruit flour is boiled, sweetened and consumed as porridge for breakfast. •Breadfruit is one of the best ingredients for making chips in its soft form. The chips out of breadfruit have been commercially manufactured in Trinidad and Barbados. 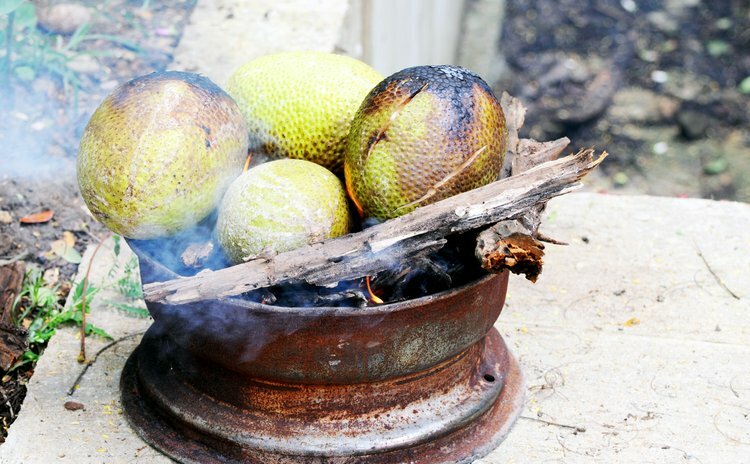 •The seeds of breadfruit can be boiled, steamed, roasted over fire and consumed with salt. In West America, they are made into a puree at times. The flower spikes of breadfruit can be boiled, peeled and consumed as a vegetable, or are candied by re-cooking for few hours in a syrup and then rolled in powdered sugar and sun-dried.